It was 10 pm and my father lay on the white sheet of the hotel bed. For a moment he gazed at the moon through the window. It was his way of saying goodnight to his beloved wife, my mother. He also hoped no southern mosquito would find its way through the tear in the net . As always, however, he was soon rocked to sleep by the sound of the tide slapping on the nearby beach. In 1964 and at that time of the night there was almost complete silence in the fishing village of Los Cristianos. 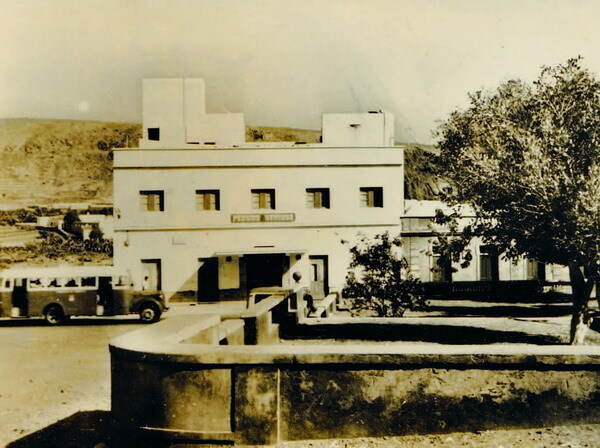 The Hostal Reverón was the only hotel in the area before southern Tenerife became a vast tourist resort. It was family-run and quite adequate. Electricity was produced by that noisy generator and although there was no hot water the rooms were spotless and the service was amicable. It was all there was, all one expected and all one needed in those days. In fact it was paradise after a day visiting the farmers in the dusty south of Tenerife. Puerto de la Cruz - 17.06.2008 - My father, apart from his official position in Puerto de la Cruz and oth­er interests, represented a Scottish fruit importer in Glasgow called McLeod and he enjoyed touring around the tomato plan­tations, not just to make sure he got the best of the season’s crop for his client but also to talk about any­thing but tomatoes with his farming friends. It was an easy going way of life. My mother sometimes accom­panied him and instead of spending a night or two at the Reverón they often camped, remembering their days in Africa, on a barren piece of land above what is now the main beach at Las Américas. However on this occasion my father’s visit to the southern tomato plan­tations became, according to his account, tremendous fun. As always he was making an early start in the morning and had just showered when there was a considerate, quiet knock on the door of his room. “Don Noel, soy Eugenio”, said the voice behind the door, “they want to talk to you!” When he opened the door he found the por­ter, Eugenio, and two po­licemen. It was Herrero and Peréstolo, the two Guardia Civil Lieutenants from Granadilla he so of­ten met on their patrols on the dusty roads around the south of Tenerife. “Forgive our disturbing you Don Noel but there is a matter of great urgency,” whispered the older of the two policemen. Before my father had time to imagine that something dreadful had happened at home the other Lieutenant explained, “we have orders to take you to La Laguna imme­diately. Apparently the British authorities need you to make a citizen’s arrest.” My father’s face lit up with sheer delight. This was just his cup of tea! Without going into detail, in his of­ficial position and in the absence of Her Majesty’s Consul who was away at the time, my father was the first British subject the local authorities turned to for assistance. The sound of the generator faded at last, the lights dimmed and all was quiet except for a dog barking somewhere in the distance. This was and still is a small island but it had tak­en time to track Don Noel down. There were no mo­bile telephones in those days. In fact there were no direct telephone con­nections at all anywhere in the islands. All calls were made through the women at the telephone exchange. Connecting a telephone in Puerto de la Cruz with one in the south of the island could take as long as fif­teen minutes. The private caller would wind up the telephone to be connected with what was known lo­cally as the ‘central’. The female operator would then make a connection with an intermediate op­erator in another town and she would then plug in on the switchboard to make the final connection. The women at the central would very often know more about the move­ments of certain individu­als than anyone else. In fact, when the Guardia Civil tried to tele­phone my father at home the operator didn’t both­er to disturb my mother so early in the morning. She simply told the police that Don Noel was not at home but on business in the south. It was through the intermediate opera­tor at Arafo, where the English señor had been to see Eduardo Curbelo, one of the tomato growers, on the previous afternoon that they were informed that he was almost cer­tainly in Los Cristianos and possibly at the Hostal Reverón. Unlike the interfering mobile but very like the Apache smoke signals, the women at the telephone exchange kept the island community in touch ef­ficiently and discretely. Unfortunately, on that particular morning, the operator in Los Cristianos turned up at her post late and missed the call. My fa­ther could not be reached through the telephone network so the Guardia Civil officers drove to Los Cristianos to look for him. The Guardia Civil from Granadilla drove my fa­ther at speed to La Laguna where he was handed over to their colleagues at the force’s H.Q. It was on the way to the airport that he was fully debriefed about the situation. Someone had tipped them off after apparently recognising a wanted Englishman. He had been spotted hav­ing a drink at the Lido San Telmo, the in-place in Puerto de la Cruz. In fact he had been buying rounds of drinks in several bars for a day or two and had been staying in a friend’s apart­ment. Local police investi­gations led them to believe the Englishman would be catching the early Madrid flight from Los Rodeos to Madrid that very morn­ing in order to then take the transatlantic plane to Caracas in Venezuela. There being no extradi­tion treaty or police co­operation agreement be­tween Britain and Spain in the 1960s the local police needed a British subject to make a citizen’s arrest in order to assist their col­leagues at Scotland Yard. They had no obligation to act but this seemed to be a special case. The gentle­man my father was to arrest was Bruce Reynolds, mas­termind behind the Great Train Robbery in August 1963. Unfortunately the plane to Madrid could not be delayed any longer and Don Noel and his Guardia Civil companions could only watch as it disap­peared into the horizon. That missed phone call in Los Cristianos had let Mr. Reynolds get away. Then, possibly due to bureau­cratic delays in Madrid, he was able to avoid deten­tion there too although he was tracked down five years later and convicted to ten years in jail. Produced with news.CMS in 0,0795 seconds.